Keep adding heat please, it ends in less than 3 HOURS! Heat added, that's a great price! Never actually been go karting, how will this work? Will you have to phone up and book in and will you just be racing against other people who have booked in at the same time? Woooo gunna book some now. Thanks!! How do these groupon deals work? do i have to be a member or summat, if me and 3 friends wanted to go then would i be able to buy 4 deals? Also its says it has sold over 4,400 of these deals, now that cant be right can it. Ive never bought any of these deals before so i have no idea what its all about. Errr. The offer is still on! Will this be done in a race format or do you just get to drive round for 50 laps? I spoke to them yesterday. Cr*p deal if you ask me. 50 laps, but each laps only takes around 25 seconds! so you'll be done in under 20 minutes. And that's it, just 50 laps, no heats or anything. 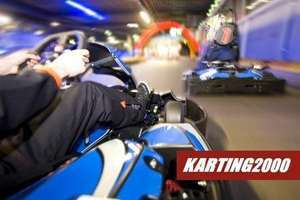 Better paying a bit more and looking at Daytona in Manchester or SpeedKarting in Warrington. And that's it, just 50 laps, no heats or anything. Still though...if you went along with 8 or so people, would it still be a race (i.e. first to 50 laps?). Thanks for the extra info though, it has put me off somewhat. Still though...if you went along with 8 or so people, would it still be a … Still though...if you went along with 8 or so people, would it still be a race (i.e. first to 50 laps? ).Thanks for the extra info though, it has put me off somewhat. Erm, not sure to be honest, I guess it would. I've been to the one in Warrington before, that was really good. There's 3 different levels, you have a 4/5 heats and then then a final grand prix at the end for the top drivers. You spend around 2 hours there and it's about £40-£50 p/p which is obviously a lot more than this offer, but well worth it IMO. Went today, was good for the money! Doesnt take long to do a lap so lasted about 20-25mins but ur knackerd after that anyway. I only got two tickets and they gave us our own slot so had the track to ourselves! Guy said they sold 6000 through Groupon.